Jauxer is a 3.5-year-old pit bull. He loves to be outside playing fetch, playing with his canine friends, doing agility, or even just lying on a nice grassy spot! 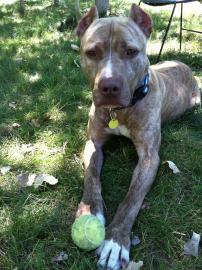 He is a very smart dog who has learned lots of tricks in his time at Humane Society of West Michigan! He would do best in a home with an experienced dog owner who would help him continue to learn new things and take him to obedience classes. 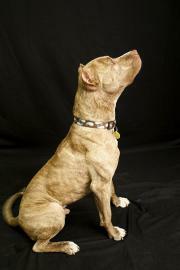 He may appear intimidating to some but if you give him a chance, he will show you the lovable dog that he is! He is a staff favorite at HSWM and although the staff would be sad to not see him every day, they would love to see him find his forever home very soon! You can visit HSWM on its website or on Facebook.